I know that several of my clients are struggling with this. Food through the day time can often be better managed. But the evening arrives, and after a long day – work commitments are over; if you have children, they are now in bed; the to-do list has been exhausted – or at least your energy to engage with it for another day! What to do with this final hour or so before you go to bed? You may be in the pattern of: - Sofa, television – ‘time for me now - let’s see what’s in the cupboard’. Is this a well-worn habit? A large part of your evening chomping might well be down to plain habit alone. You associate food with winding down and taking take of yourself. If so, think about creating some different ways to relax. To start with, you may struggle with this. What else seems anyway near as appealing as that juicy dough-not or tangy jaffa cake? Experiment with just doing things a bit differently in your evening. Say yes to something you normally wouldn’t do and step out of your comfort zone – it doesn’t even have to involve leaving the house. Is food your number one pleasure and reward? In a busy and overwhelming life with a never-ending to-do list, then food can be the pinnacle of pleasure and the thing we look forward to. Work hard to increase your pleasure quota by finding other ways that bring you happiness and contentment. Are you being too ‘good’ in the day and somehow feeling deprived by the evening? If you are counting calories or only eating certain foods or your meal plan is too boring and not satisfying enough, then you may lean towards perceived tastier alternatives in the evening. Permit the dough-nut to be eaten earlier on in the day. Sit down and enjoy every tasty morsel of it without guilt. 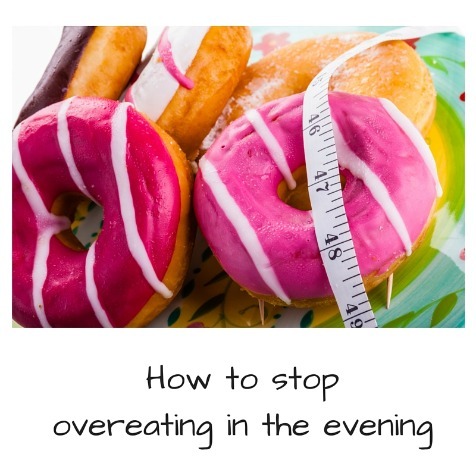 Don’t confine certain foods to the evening – this will emphasise their ‘specialness’. Are you on a blood sugar rollercoaster already? If you have eaten a lot of sugary food through the day, then your blood sugar will naturally be up and down. You will be physiologically craving more sugar – this is normal. Don’t ban sugary foods, but also be wise about keeping blood sugar stable and not getting over-hungry. Nothing better induces a huge binge than eating sugary food on an empty stomach. Are you finding joy in your daily routine? How do you feel about your job or your home commitments? Is the balance right for you? If you are feeling weighed down and pressured or constantly stressed, then again food can take on more meaning that you would like it to. Evening eating becomes the part of the day to look forward to. 6. WHAT DO YOU REALLY NEED? If you want to eat something but know you are doing it for craving or emotional reasons rather than hunger, ask yourself the question - 'what is it that I really need?' Is it a hug? Are you feeling lonely? Are you feeling bad about yourself? What purpose is the food serving? Have a go. Be patient and kind with yourself. Breaking our habits takes persistence and time. If food is filling a void for you, then removing it might feel very uncomfortable at first. This doesn’t have to be feared – listening to your inner voice and touching base with your feelings can place you on the beginning of the road to doing things differently.